Thoughtless influence is the theme of Robert Cialdini’s book: Influence – The Psychology of Persuasion. Here’s a good YouTube summary (20 min). And next some nuggets from Cialdini’s goldmine to show how this all helps with life and equalism. First, the turkey: Mother turkeys respond by instant innate reflex – ‘click-whirr’ – to the sound of their offspring’s ‘cheep-cheep’. That’s fine. Mother turkeys also react defensively to predators like polecats. That’s fine too. Automatic behaviour fits turkeys for evolutionary survival … if not for human beings at Christmas and Thanksgiving. But sometimes click-whirr is not fine. If a stuffed polecat mimics that ‘cheep-cheep’, the mother turkey is fooled and takes the predator under her wing! So birdbrains work fine … except when they don’t. Second, thoughtless influence: For most of our own long timeline of evolution and tribal-living, human beings’ brains have only needed to handle the familiar information of daily local life. We learn and use lots of short-cut click-whirr birdbrain-style responses. Thoughtless influence usually works fine for us too, just like the mother turkey’s instinctual one. As Alvin Tofler predicted in Future Shock, the superior intelligence of that same human brain of ours has now produced a very different world. Now the world is our village. We’re flooded with complicated confusing information. World-wide information pours over us 24/7 through the internet. Our thoughtless short-cuts have to work overtime as we cope with unprecedented “novelty, transience, diversity and acceleration” (page 274). It’s no surprise that thoughtless influences easily fool us into making mistakes. And that’s rich pickings for sellers, for con-artists, and for those targeting recruits for mind-control organisations. Find out more on these most serious, sustained and harmful, coercive patterns of ‘undue’ influence from: Learning about a common enemy and OpenMindsFoundation.org. By the way, note that it is our slow thoughtful intelligence, not the fast thoughtless kind, that makes humans superior. Slow thinking is what we used to create our buzzing new world. Nobel prizewinner, Daniel Kahneman, developed this same idea of Thinking Fast and Slow, each speed with its strengths and weaknesses. ‘Birdbrain’ here is a description of usually highly functional click-whirr reactions. A birdbrain may make serious mistakes. But here the word is not an insult. Find more about fast and slow thinking etc in this blogpost which also lists 80 cheep-cheep birdbrain mistakes that can happen simultaneously to blind us to one human example of destructive and harmful undue influence. Very often in making a decision about someone or something, we don’t use all the relevant available information; we use instead only a single, highly representative piece of the total. And an isolated piece of information, even though it normally counsels us correctly, can lead us to clearly stupid mistakes – mistakes that when exploited by clever others, leave us looking silly or worse. There’s more of a summary of Cialdini’s book below, with his (now) seven kinds of trigger influences that make us more likely to say yes. But the Frank Zappa lesson takes us straight to the point for equalism. Misunderstanding and unfair treatment between people can result from exactly the same birdbrained click-whirr thinking. Click-whirr works fine for local familiar members of our own kind and tribe. But thoughtless reactions based on a striking and representative piece of the available information is a big mistake when we’re faced with people who are different from us. 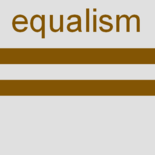 On equalism.org.uk we use the Social GRACES to show the range of social inequalities, the common kinds of difference that trip us up if we click-whirr on them. These categories of human group difference trigger misunderstanding and inequality in ordinary personal interaction and also in general through our social beliefs, prejudice, treatment, policies and services. The expanding list of Social GGRRAAACCEEESSS is: Gender, Geography; Race, Religion; Age, Ability, Appearance; Class, Culture; Ethnicity, Education, Employment; Sexuality, Sexual orientation, Spirituality. The patterns of inequality that may fall on all these categories of social difference happens in exactly the way Cialdini describes for the click-whirr birdbrained short-cut thoughtless reaction. Our short-cut birdbrains pick up on the one highly representative piece of the total information available. This cannot work well with people who are different to our own norms. The Social GRACES remind us of well-known situations where we need to switch from birdbrain to slow brain, and to use more of the available information. Stick to the single highly representative piece of the total – gender or ethnicity, the long hair or the wooden leg – and we short-cut our way to stupid mistakes. Many of the categories of Social GRACES are of a kind that you can – or you think you can – spot right away. Gender, age, class, race, ethnicity, geography, ability, culture, maybe religion too – all these tend to show immediately in a person’s appearance, clothes, behaviour, talk, skin colour, or context. Some of the Social GRACES categories may not be so instantly spotted. And some people try to hide that key bit of information – their sexuality, religion, education / job, or their spirituality. The hidden bits of information are hidden because mistaken reactions can be extreme as well as instant. our ability to conjure up a mental picture of a person and ascribe qualities to them based purely on words [and] labels. Try it yourself – ‘Mohammed Emwazi and Barnaby Carruthers-Smythe’. Got a picture of them both? I’ll bet you have. As with all the Social GRACES we get that instant picture along with instant assumptions and prejudices too. “All men are … / All women are …” “All old people are …/ All young people are …” etc etc etc What we need to do instead is to slow down, change gear, notice and set aside our instant mental picture, and instead take in all the relevant available information about the person or their group identity. This is not easy as we rush through our busy lives. Treating other people fairly and equally – with respect for difference – takes some really hard work, even when you’re face to face with the person. But it is possible. The Social GRACES remind us. It is much harder for society and governments. Big social systems are bound to use the general categories impersonally, bureaucratically. “All immigrants should …” “All people on benefits are …” “All single parents must …” etc etc etc. Tick-boxes force us all into birdbrained thinking – even when there’s lots of tick-boxes to put together. A tick-box takes a single piece of information and leaves out the rest of the total picture about an individual person or even their identified group. As well as using our own slow thinking, we need to learn how to be objective, think critically, discover how good logic and science helps train us. Has slowing down the click-whirr helped? The heading and opening paragraph purposely opened at speed. We’ve slowed it down to make more sense of it. Thanks for reading this far. Have these nuggets of Cialdini made sense? Do the key ideas fit together? … How the constant natural thoughtless reactions of mother turkeys and human beings are needed to get by and survive? How we need to spot when not to be birdbrained and to switch to slow thinking instead? How the Social GRACES show how we jump to conclusions about unfamiliar people based on the one bit of information? There are vast fields of study covering the hundreds of ordinary social influences all of us get and give all the time throughout our lives. Mostly we like to think of these as positive influences – from our parents and family, from friends and neighbours, from teachers and education, from books, media and social media, from culture, customs, religion, law and society in general. In his books, Influence and Pre-suasion, Cialdini focuses on the more specialist ‘compliance professionals’ and their methods that range from just about ethical to definitely unethical and ‘undue influence’. These are people whose job it is to get us to buy and agree to do stuff they want us to buy and do. Of course, as an expert in persuasion, he makes it easy to read his richly evidenced books – we’ve all been sold things, haven’t we?! (Those headings make a handy acronym: CU RASC’L.) For all of these triggers of influence, the power of the influence is based in the same old autopilot short-cut click-whirr fast unthinking reactions. Cialdini finishes each chapter with advice on how to resist persuasion, to pause the automatic yes and to say no instead. And of course you’ll have got the answer by now: The trick is in knowing when and how to spot and switch out of fast reacting and to stop using only a single piece of the available information. Instead, we need to switch to slow thinking and to using more of the total available information. Awesome post. Enjoyed reading it so much !! This entry was posted on 16 July 2017 by Nick Child in Equalism in general, Influence, issues & 'ism's and tagged Equalism, Influence, Social GRACES.